Argentina's president has called on the UK government to hand over the Falkland Islands, in an open letter printed in British newspapers. Cristina Fernandez de Kirchner urges Prime Minister David Cameron to abide by a 1965 UN resolution to "negotiate a solution" over the islands. The letter says they were forcibly stripped from Argentina in "a blatant exercise of 19th Century colonialism". The government said the Falklands' population had chosen to be British. The Foreign Office said there could be no negotiations on the sovereignty of the Falklands "unless and until such time as the islanders so wish". A referendum on the islands' political status is to be held in March. The letter, published as an advert in the Guardian newspaper and the Independent, follows repeated calls by President Fernandez for the islands - which are known as the Malvinas in Argentina - to come under the sovereignty of her nation. Last year, marked 30 years since the Falklands War, when the islands were occupied by Argentine forces for 74 days. Ms Fernandez says her letter is published on the same date - 3 January - when, 180 years ago: "Argentina was forcibly stripped of the Malvinas Islands, which are situated 14,000 km (8,700 miles) away from London". She goes on: "The Argentines on the Islands were expelled by the Royal Navy and the United Kingdom subsequently began a population implantation process similar to that applied to other territories under colonial rule. "Since then, Britain, the colonial power, has refused to return the territories to the Argentine Republic, thus preventing it from restoring its territorial integrity." In her final paragraph, she ends: "In the name of the Argentine people, I reiterate our invitation for us to abide by the resolutions of the United Nations." Argentina says it inherited ownership of the islands from Spain, arguing that British colonists occupied the islands by force in 1833 and expelled settlers, violating Argentina's territorial integrity. It also bases its claim on the islands' proximity to the South American mainland. The islands' capital, Port Stanley, lies about 1,180 miles (1,898km) from the Argentine capital Buenos Aires. The historical account provided by Ms Fernandez differs from the one provided by the Foreign Office on its website. Whereas Argentina's president says her country was "forcibly stripped" of control in 1833, the Foreign Office site says an interim governor appointed by ministers in Buenos Aires was murdered by his own men and a British warship subsequently "told" his 24-man garrison to leave. British administration, which dated back to 1765, was therefore resumed. The Foreign Office website also refers to the 1965 UN resolution which, it says, "invited the British and Argentine governments to begin negotiations 'with a view to finding a peaceful solution to the problem, bearing in mind the provisions and objectives of the UN Charter and... the interests of the population of the Falkland Islands (Malvinas).'" 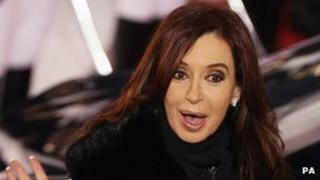 A Foreign Office spokeswoman said that the Falkland Islanders "are British and have chosen to be so". "They remain free to choose their own futures, both politically and economically, and have a right to self-determination as enshrined in the UN Charter," she added. "This is a fundamental human right for all peoples. "There are three parties to this debate, not just two as Argentina likes to pretend. "The islanders can't just be written out of history." In June, UK Prime Minister David Cameron confronted President Fernandez about the issue when they came face-to-face at the G20 summit. During the exchange, the prime minister rejected her demand for negotiations over the sovereignty of the islands and told her that she should respect the result of a referendum . The Argentine president had earlier raised her demands at the United Nations, appearing at the annual meeting of the UN decolonisation committee on the 30th anniversary of the end of Argentine occupation. She used the occasion to reiterate Argentina's opposition to any more wars and to criticise the prime minister's decision to mark the day by flying the Falklands flag over 10 Downing Street. In December, Argentina protested at Britain's decision to name part of Antarctica, Queen Elizabeth Land. A formal protest note was given to the British ambassador, John Freeman, in Buenos Aires.